This winter I'm endeavouring to keep up my intake of fresh veg by incorporating them into my lunches. But raw veg don't exactly excite at this time of year, do they? Homemade soup is the solution. 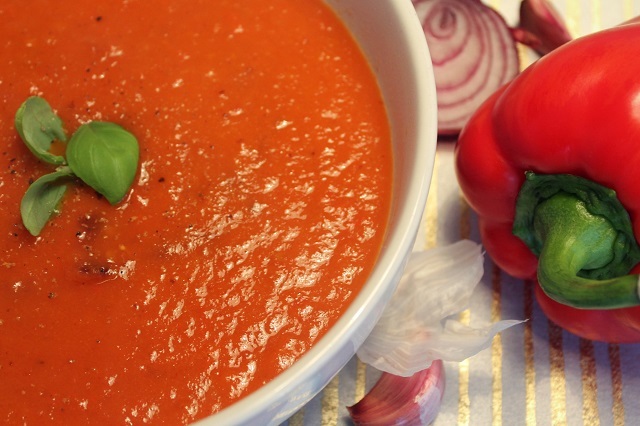 Warming, flavoursome and colourful this soup combines nutrients and comfort perfectly. This recipe is adapted from Nigella. The method is easy and it doesn't require much attention. Using tinned toms makes it easier and more economical (I added a couple of fresh ones as I had some already). Red peppers can be expensive in supermarkets so shop around - I bought 3 for 69p yesterday at my local greengrocers in town. Support the high street and enjoy! Preheat the oven to 200C/440F/gas 6. Add all the chopped veg to a high sided baking tray, drizzle over the olive oil and mix together with your hands. Roast for 35 to 40 minutes or until the peppers are slightly charred. Next make the stock and add to a large saucepan together with the chopped tomatoes and a drop of Tabasco if liked (I prefer not to add salt and pepper to shop bought stock cubes). Remove the veg from the oven. Take out the roasted garlic cloves and squeeze out the pulpy flesh into the stock (dispose of the skin). Add the rest of the veg to the pan and heat gently until just boiling. Once heated put the mixture into a blender and blend until fairly smooth. Serve and savour. Hi Claire - Your soup looks delicious - I'm anxious to give it a try. I agree with you about raw veggies this time of year. I still eat plenty of salad but on a cold, damp day there's nothing like a delicious bowl of hot soup. Thanks for sharing the recipe.